Although we don’t have to worry too much about the snowstorms that hit most of the nation during winter months, there are times when ice and freezing rain can cause havoc on our roadways. It’s always best to stay off the roads when this type of weather hits, but unfortunately, truck drivers don’t have that luxury. They have a schedule to keep and that means driving in some horrific weather. Sometimes a truck driver doesn’t realize how dangerous the roads are and drive at unsafe speeds. This can be a recipe for disaster. According to the U.S. Department of Transportation’s Federal Highway Administration, 24 percent of weather-related accidents each year occur when the pavement is snowy, slushy or icy and 15 percent happen during either a snowfall or sleet. On an annual basis, more than 1,300 people are killed and more than 116,800 people are injured when the pavements become snowy. Not only does the weather wreck havoc with drivers, it can do some damage to many states’ wallets — the FHA says that winter road maintenance accounts for roughly 20 percent of many states’ DOT maintenance budgets. Just think, millions are spent repairing any infrastructure damage caused by snow and ice! Let’s say you have to drive to work in poor conditions. You take your time and keep your eyes on the road. Meanwhile, an 18-wheeler goes barreling past you at a high rate of speed. As it swerves in front of you, you start to see it skid. The truck begins to jackknife and there’s no way you can avoid the accident. The accident causes severe injuries and totals your vehicle. Now what? The truck driver has the responsibility of driving safely and when that trucker fails in his duty of care, then he is negligent. Since that truck driver was driving in a careless manner (i.e. driving at an unsafe speed for the conditions of the road), then you have a personal injury claim against that driver. However, the truck driver may not be the only one responsible for your accident. For instance, let’s say there were defective tires on the truck which was a cause in the accident. Then you also have a case against the manufacturer of the tires. Or, let’s say the truck driver did not receive the proper training on how to drive in poor weather conditions. Then it’s a case against his/her employer. 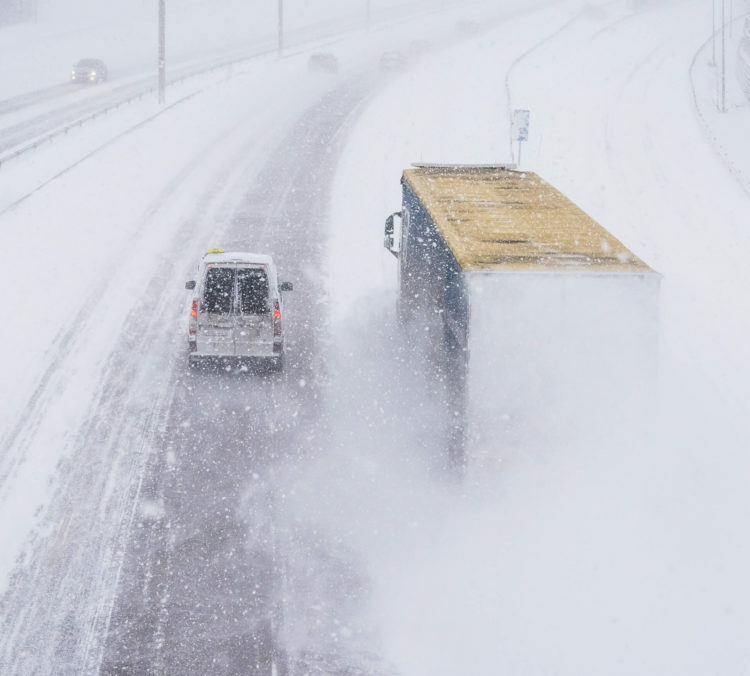 As you can see, truck accident cases can be extremely complex, especially when it involves bad weather. If you get into a truck accident, don’t delay. Contact the Houston 18-wheeler accident lawyers at de Lachica Law Firm now for a free consultation.